The VERDIER family has been making knives at Pont de Celles for three generations. It is only recently that Frédéric VERDIER opened his workshop to the public, permanently. First of all, there is a story. It is in this place that Lucien VERDIER began his career. "It's true, from 1930 to 1936, my grandfather worked here, with BEAUJEU. Then he set up on his own, nearby" explains Frédéric. "My father took over in 1960". After obtaining a degree in maintenance of industrial automation, Frédéric finally joined the family's business, by chance. "It was in 1996. I tried to bring something new with a high-end finish on forged knives. Then I sold my share to my brother and bought these premises to create my own business. It was in 2006." Nowadays Frédéric specializes in forged kitchen knives, but that's not all: "I have a subcontracting activity for bigger cutlery industries in Thiers. I also began producing folding knives. The brotherhood of the Couté de Tié welcomed me sincerely, and I am now part of the council of Jurande. Which means that I participate in choosing the models of other cutlers that show superior quality." Despite his expertise, the boss explains that, like many others, his business has gone through a slowdown in 2010. "I used to spend my time on the roads, trying to gain the loyalty of clients. I was wearing myself out... So I tried to diversify, I decided to jump into something new, and to sell directly to people".Now, Frédéric considers he made the right choice. "The business improved". Frédéric decided to open his workshop to the public. "People like to come and see the place where the knives are made. We show them the different stages of production, from the steel to the finishing and the choice of the handle without overdoing it". Tours last about 20 minutes. The process of production, the cutting-out, and the entire evolution of the knife are explained. "You don't have to make an appointment to come and visit the workshop. So it is not always easy to manage when a group arrives unexpectedly. You have to juggle work and visits. But most of the visitors buy at least one knife after the visit. It is a real booster". 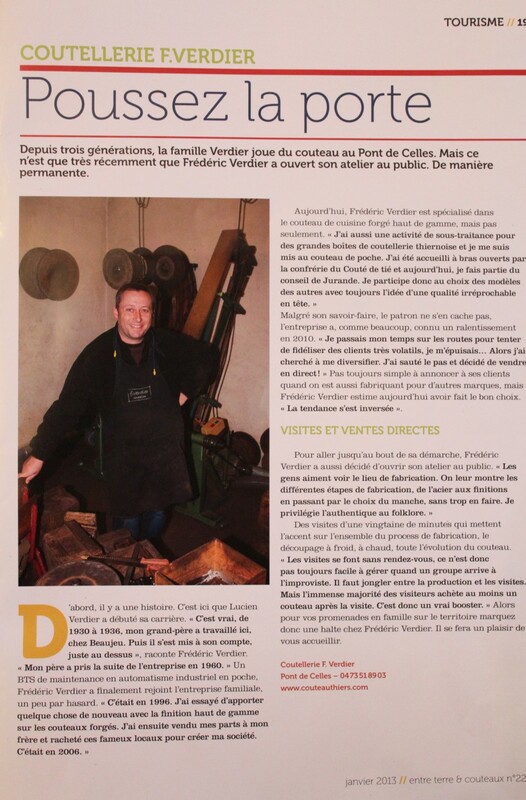 So if your family is traveling through Auvergne, stop at Frédéric VERDIER's workshop. He will welcome you with pleasure.